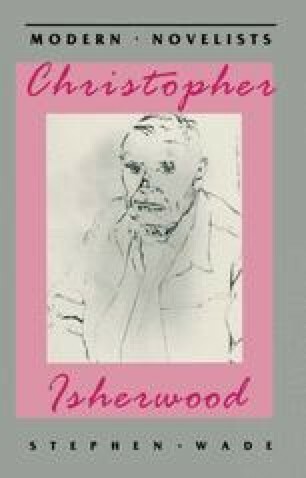 Isherwood’s novels illustrate many of the current critical issues concerning the nature of narrative, and yet they also show, quite outstandingly, the nature and strengths of the autobiographical novelist’s art. These two facts do not lie easily together as one is complex, theoretical and uncertain, whereas the other is simple and familiar: novelists who depended almost entirely on their own diaries and journals for fictional material are numerous. Writers as different as Arnold Bennett and D. H. Lawrence rely heavily on personal experience and on writings other than novelistic ones in their preparations for their best work. Where Isherwood is particularly interesting is in the context of the study of fiction as a search for self-understanding, even, it has been said, to a narcissistic degree.